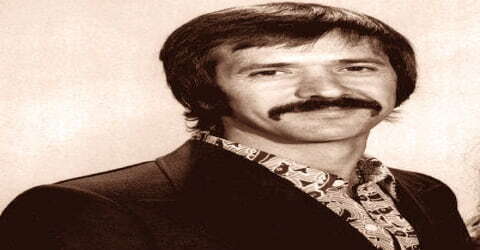 Sonny Bono – American singer-songwriter, producer, actor, and politician. 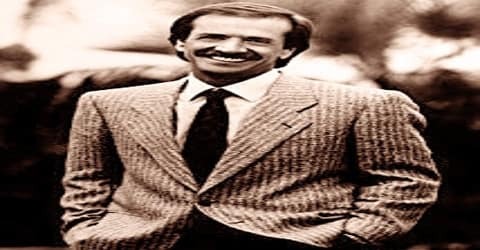 American entertainer, restaurateur, and politician, Sonny Bono was born on February 16, 1935, Detroit, Michigan, the U.S. to Santo Bono (born in Montelepre, Palermo, Italy) and Zena “Jean” Bono (née La Valle). He came to fame in partnership with his second wife Cher, as the popular singing duo Sonny & Cher. He was mayor of Palm Springs, California from 1988 to 1992, and the Republican congressman for California’s 44th district from 1995 until his death in 1998. Bono enjoyed a political career that culminated in service in the U.S. House of Representatives but was better remembered as a performer and the driving force behind the singing duo Sonny and Cher. The two had a number of hits on the pop charts in the 1960s and ’70s and were the hosts of a successful television variety show in the ’70s. Popularly known as ‘Sonny Bono’, he was an eminent American singer, producer, and politician. He rose to fame with the song “I got you Babe” which he sang in collaboration with his then-girlfriend Cher. Bono began his career as a songwriter and moved on to acting in various television shows. His entry into the world of politics stems from his frustration regarding the local government bureaucracy he faced while trying to open a restaurant in Palm Springs, California. However, his life came to an abrupt end in a tragic skiing incident on the Nevada side of Heavenly Ski Resort, California. Till today, the world has not stopped speculating about his death. Bono still remains as the only Congressman to have scored a number one pop single on the US Billboard Hot 100 chart. The United States Copyright Term Extension Act of 1998, which extended the term of copyright by 20 years, was named in honor of Bono when it was passed by Congress nine months after his death. Mary Bono (Sonny’s last wife) had been one of the original sponsors of the legislation, commonly known as the Sonny Bono Copyright Term Extension Act. Salvatore Phillip “Sonny” Bono was born on 16th February 1935 in Detroit, Michigan to Santo Bono and Zena Jean who were immigrants from Sicily. It was his mother who gave him the nickname “Sonny”, and he became famous with this name later in life. He was the youngest of the three children; the other two being his two elder sisters, Fran and Betty. The family moved to Inglewood, California when he was seven, and his parents divorced soon afterward. Bono decided early in life to become part of the music business, and began writing songs as a teenager. “Koko Joe”, a song he wrote at age 16, was recorded by Don and Dewey in 1958, and later covered by several other artists including The Righteous Brothers. Bono attended Inglewood High School but did not graduate, opting to drop out so he could begin to pursue a career as a songwriter and performer. He worked at a variety of jobs while trying to break into the music business, including waiter, truck driver, construction laborer, and butcher’s helper. 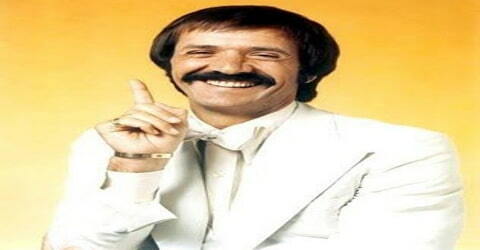 Sonny Bono married four times in his life. Bono married his first wife, Donna Rankin, on November 3, 1954. Their daughter Christine (“Christy”) was born on June 24, 1958. They divorced in 1962. In 1964, Bono married singer and actress Cher. They had one child, Chaz, born March 4, 1969. In 1975 they divorced. Bono then married Susie Coelho in 1983 but divorced her within a year in 1984. His fourth and final marriage in 1986, with Mary Whitaker, bore him two children, a son named Chesare Elan and a daughter named Chianna Maria, born in 1988 and 1991 respectively. The couple stayed married until his tragic death in 1998. Bono was a champion of the Salton Sea in southeastern California, where a park was named in his honor. The 2005 documentary film Plagues & Pleasures on the Salton Sea (narrated by John Waters) features Bono and documented the lives of the inhabitants of Bombay Beach, Niland, and Salton City, as well as the ecological issues associated with the Sea. 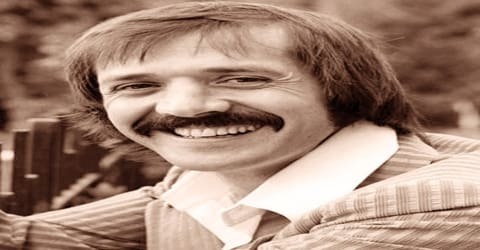 Sonny Bono’s first tryst with the entertainment industry came as a songwriter at Specialty Records in the early years of the 1960s. Sam Cooke, who was already an influential singer at the time, recorded ‘Things You Do to me’, which was written by Bono. This put him in the music industry and Phil Spector picked him up for doing promotion for his company. He also worked with the likes of Jack Nitzsche, also a part of the same team, with whom he wrote ‘Needles and Pins’. Later in the same decade, he achieved commercial success with his then-wife Cher in the singing duo Sonny and Cher. Bono wrote, arranged, and produced a number of hit records including the singles “I Got You Babe” and “The Beat Goes On”, although Cher received more attention as a performer. He played a major part in Cher’s solo recording career, writing and producing singles including “Bang Bang” and “You Better Sit Down Kids”. He’d initially found success with the generic “High School Dance,” which was recorded by Larry Williams as the B-side to “Short Fat Fanny,” and soon grabbed a chunk of the British Invasion action with “Needles and Pins,” which he co-authored with fellow Spector protégé Jack Nitzsche. The latter song was first recorded in 1963 by Jackie DeShannon, whose rendition was heard by Cliff Bennett & the Rebel Rousers, a British band that had yet to score their first hit, who added it to their stage repertory at the Star-Club in Hamburg, where it was heard by the Searchers, who were looking for a potential third single. The Searchers, in turn, completely reinvented the song from the ground up, with a version that hit number one in England and made the Top 20 in America in the process, they also came up with a riff and a sound that became the blueprint for the folk-rock boom initiated by the Byrds in 1965. Bono, in the meantime, had made the acquaintance of Cherilyn LaPierre, 11 years his junior, and brought her to Gold Star as a session singer. Their association continued to produce many songs and other performances for the better part of a decade. Other hits of the duo include ‘Bang Bang’, ‘The Beat Goes On’, ‘You Better Sit Down’ and ‘Baby Don’t Go’. Bono co-wrote “She Said Yeah”, covered by The Rolling Stones on their 1965 LP December’s Children. His lone hit single as a solo artist, “Laugh at Me,” was released in 1965 and peaked at No. 10 on the Billboard Hot 100. In live concerts, Bono would introduce the song by saying “I’d like to sing a medley of my hit.” His only other single as a solo artist, “The Revolution Kind,” reached No. 70 on the Billboard Hot 100 later that year. His solo album, Inner Views, was released in 1967. Apart from singing, the couple also started a popular television show in 1971 ‘The Sonny and Cher Show’- where singing was accompanied by light comedy. The show was quite successful initially but it was taken off air in 1974. His first single, ‘Laugh at Me’, reached the 10th spot on the US billboards in 1965. Two years later, he released his only solo album named ‘Inner Views’. Rescue of Bono’s career came when he and Cher played Las Vegas, initially as an opening act. They landed a contract with Decca Records and a chance at a variety show on CBS, and by 1972, they were back as television stars and top entertainers. For the second time, Sonny Bono reinvented himself now Sonny & Cher were a modern version of George Burns and Gracie Allen, with Bono as the straight man has gone were the fur vests and boots, instead, he was a diminutive foil to Cher’s sexually provocative comedienne. And the music wasn’t pop/rock anymore, but mainstream pop, aimed as much at parents as teenagers, and Bono wasn’t writing or producing it. From 1972 onward, it was Cher’s voice that was the focus of the duo’s work and her solo career the main thrust of most of the recording that went on around the couple. Their on-screen chemistry hid the fact that their marriage was coming apart; by 1974, however, their split had become public knowledge and with it the end of their television show. 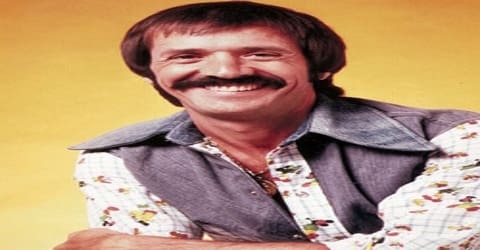 Sonny Bono continued to work with Cher through the early and mid-1970s, starring in a popular television variety show, The Sonny and Cher Comedy Hour, which ran on CBS from 1971 to 1974. From 1976 to 1977, the duo, since divorced, returned to perform together on The Sonny and Cher Show. Their last appearance together was on Late Night with David Letterman on November 13, 1987, on which they sang “I Got You Babe”. Sonny was a man who liked wearing many hats and it is evident from the fact that apart from writing, singing, producing and arranging songs, he also appeared in films and television shows on multiple occasions. He was majorly a guest star who would appear for a brief time on television shows such as ‘Fantasy Land’, ‘The Love Boat’, ‘Top of the Hill’, ‘P.S I Luv U’ and ‘Lois & Clark: The New Adventures of Spiderman’. He also played some small roles in movies such as ‘Airplane II: The Sequel (1982) and ‘First Kid’ (1996). Bono’s acting career included bit parts as a guest performer in such television series as Fantasy Island, Charlie’s Angels, The Love Boat, The Six Million Dollar Man and CHiPs. In the 1975 TV movie Murder on Flight 502, where he played Jack Marshall. He appeared in the 1980 miniseries Top of the Hill. He played the role of mad bomber Joe Selucci in Airplane II: The Sequel (1982) and appeared in the horror film Troll (1986). He also portrayed racist entrepreneur Franklin Von Tussle in the John Waters film Hairspray (1988). In Men in Black (1997), Bono is one of several oddball celebrities seen on a wall of video screens that monitor extraterrestrials living among us. He also appeared as the Mayor of Palm Springs (which he actually was at the time) in several episodes of P.S. I Luv U during 1991–92 TV season, and on Lois & Clark: The New Adventures of Superman (in Season 1, Episode 9, which aired November 21, 1993), in which he played Mayor Frank Berkowitz. He also made a minor appearance as himself in the comedy film First Kid (1996). Bono guest-starred as himself on The Golden Girls episode “Mrs. George Devereaux” (originally broadcast November 17, 1990), in which he vied with Lyle Waggoner for Dorothy’s (Bea Arthur) affection in a dream sequence. In Blanche’s (Rue McClanahan) dream, her husband is still alive, and Bono uses his power as Mayor of Palm Springs to have Waggoner falsely arrested so he can have Dorothy to himself. Bono’s attempt at a television variety show was a dismal failure, and by the end of the decade, Bono had ceased working as an entertainer, and he next emerged before the public in 1988, in a totally unexpected way. Bono by then was the owner of an Italian restaurant in Palm Springs, CA, and was infuriated by the tangle of permits that he found he’d needed from the city while trying to put a new sign up on his establishment. As a result, he ran for mayor and won. He served a four-year term and then, in 1992, decided to run for the United States Senate as a Republican. Bono lost that race but two years later was swept into office as a congressman from the 44th district in California. He became part of Newt Gingrich’s Republican revolution in Congress and was highly visible in espousing conservative positions on crime and environmental legislation, as well as (understandably) entertainment law. His opposition to zoning regulations in Palm Springs, Calif., inspired him to enter the 1988 mayoral election there, which he won. Bono’s success in that post prompted him to run for the U.S. Senate in 1992, but he lost in the Republican primary. His sense of humor was especially prized, and he was one of the most sought-after fund-raising speakers. In 1994, Bono was elected as the representative of California’s 44th Congressional District to the US House of Representatives and was reelected in 1996. He was a popular figure in the house and was instrumental in bringing a copyright extension bill, which was later dedicated to his memory and named after him. 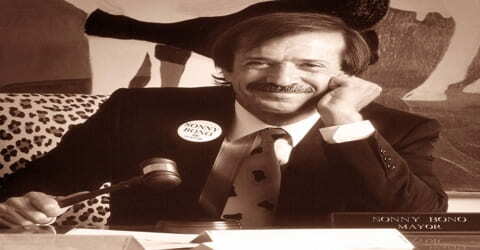 Sonny Bono became interested in Scientology and took Scientology courses partly because of the influence of Mimi Rogers, but stated that he was a Roman Catholic on all official documents, campaign materials, and websites. His wife Mary also took Scientology courses. However, after his death, Mary Bono stated that “Sonny did try to break away from the Church of Scientology at one point, and they made it very difficult for him.” The Church of Scientology said there was no estrangement from Bono. Sonny Bono was also awarded a star on Hollywood Walk of Fame for Television posthumously in 1998. 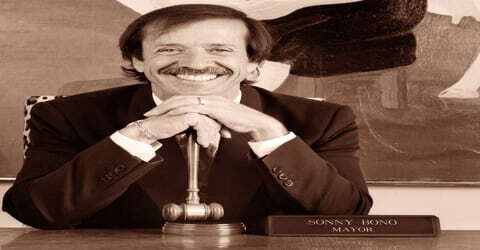 In 2011, Sonny Bono was inducted into the Michigan Rock and Roll Legends Hall of Fame. There is a park near the Salton Sea in California named in Bono’s honor. There is also a Golden Palm Star on the Palm Springs Walk of Stars dedicated to him. Sonny Bono was killed January 5, 1998, when he hit a tree while skiing at Heavenly Mountain Resort near South Lake Tahoe, California. His death caused controversy after his wife, Mary, claimed that he was heavily on painkillers at the time of his death. Although the autopsy came back clean, many believe that Bono was high at the time of his death. At Mary’s request, Cher gave a eulogy at Sonny’s funeral. He was buried at Desert Memorial Park in Cathedral City, California. 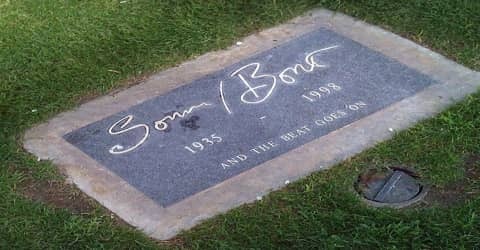 The epitaph on Bono’s headstone reads AND THE BEAT GOES ON. Mary was elected to fill the remainder of her husband’s congressional term. She was elected in her own right seven subsequent times before being defeated in the election of 2012. Sonny and Cher’s ‘I Got You Babe’ reached the top spot in the billboards of both America and Britain. The duo’s ‘Bang Bang’ sold over a million copies worldwide. During the final 15 years of his life, Bono was far removed from music, apart from handling business affairs relating to his and Cher’s work in the 1960s and 1970s; this, coupled with his somewhat comically nebbish-like image during the couple’s early-’70s re-emergence, combined with his newly public conservative political career, led to some derision of him among pundits and in modern entertainment circles. His death, by contrast, led to a media feeding frenzy that was as ludicrous in its intensity as the earlier denigration of his work had been. During the year 2000, reflecting the restored interest in Bono’s music career, Rhino Records released a CD of Inner Views through its esoteric Rhino-Handmade imprint.